Today the noble people of independent Tajikistan are overjoyed as their long-awaited desire, i.e. the launch of the first unit of the life-changing ‘Roghun’ Hydropower Plant and start of generation of power in this facility has become true. This milestone moment shall be recorded with golden letters in the new history of independent and sovereign Tajikistan our current and future generations shall be proud of and honored with it. I offer my heartfelt congratulations on this occasion to all of the residents of our country, compatriots abroad. 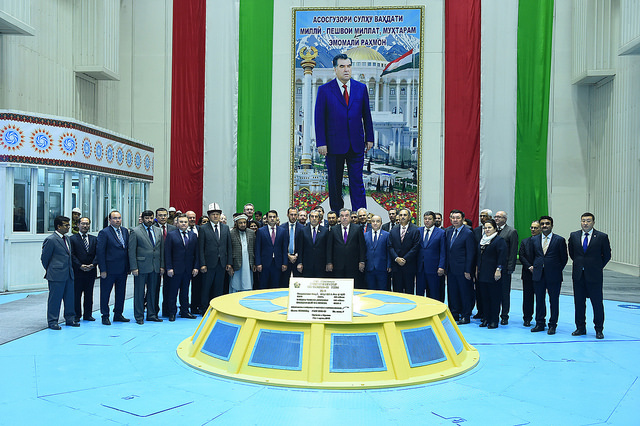 May I commend the constructors of this grand facility of light, who have bravely and patiently demonstrated high sense of national dignity and patriotism in the field of creative efforts and the scene of national dedication and extend my gratitude on behalf of the Government of Tajikistan! With all financial and economic difficulties and by feeling its high responsibility before the people of Tajikistan, the Tajik Government has channeled every possible effort and resources for construction of the power plant and creating a favorable working environment for its specialists and staff since the beginning of the construction activities. We have done so as it was clear to us that ‘Roghun’ HPP is the most important factor of socio-economic development, decent life of people, i.e. future prosperity of our beloved Tajikistan. Thanks to the measures undertaken by the Government in this regard as well as the hard and dedicated efforts made by the builders of this historical facility the day is not far away when we will achieve one of our national strategic objectives - energy security - as the main prerequisite for addressing our country’s major socio-economic issues. This project is also of a particular significance for expanding regional cooperation since it will serve all countries of the region by using renewable energy sources and generating environmentally clean power and its reservoir will play an important role for regulation of water resources, particularly during low-water seasons and droughts. The construction and installation activities in this power plant have been implemented according to international standards based on well-grounded studies conducted by highly qualified and experienced experts and involvement of globally prominent companies. We would like to reassure you all to follow in this way until the full completion of the project. Let me emphasize that we spent almost six years for the project studies conducted by top-notch specialists and experts of the World Bank Group. As a result of the international tender, we trusted the Italian Company of ‘Salini Impregilo’ to construct the plant’s dam, which requires highest level of professionalism and expertise. As our dear compatriots remember, we diverted the Vakhsh river on 29 October 2016 and thereby laid a firm foundation for the construction of the coffer-dam for the 335meter dam of the power plant. Up to date the cavern powerhouse and transformers constructed and some units installed, are unique in the world. I would like to deliver my sincere gratitude on behalf of the Government and people of Tajikistan to international financial institutions, all of the local and international engineers and specialists, including heads and staff of reputable international companies, who installed the water-wheel generators in the facility’s sixth unit professionally and in a timely manner, and now have been continuing such activities in the fifth unit of the asset. Construction and installation activities in the ‘Roghun’ HPP are implemented with involvement of 67 organizations and entities, famous local and international contractors and a total of more than 22 000 specialists and workers, 90% of whom are Tajik citizens, as well as 3600 units of machinery. It is worthwhile noting that the construction of this power plant requires every person participating in this process, primarily tunnel heading specialists and overall all specialists and workers to work hard and be courageous, since 90% of activities are implemented under the ground. Indeed, the construction of ‘Roghun’ HPP is a unique school for all local and international companies. It provided an opportunity to train thousands of Tajik specialists with expertise for the international market of construction of hydropower plants. I am confident that the Tajik specialists will be able to apply their great experience in this area not only in our country, but also in other countries widely in the future. During 27 years of our independence, we completed 25 projects amounting 23bn Tajik Somoni and nine projects amounting 6bn Tajik Somoni are ongoing to increase our country’s energy generation capacity, enhance the energy system, ensure quality and reliable energy supply of the different social and economic sectors, and customers’ continuous access to power, and reduce energy loss. In parallel with the activities aimed at launching the first unit of ‘Roghun’ HPP and starting generation of initial electricity in this facility that we now witness, we also implemented many activities in other main and auxiliary entities of this project. These activities include the construction and commissioning of ‘Roghun-Dushanbe’ 500 kw/h power transmission line amounting 745m Tajik Somoni and the HPP substation amounting 630m. Thanks to these facilities, we connected the ‘Roghun’ HPP to Tajikistan’s unified power grid several minutes ago and the electricity generated in this asset outreached the households of every resident of our country. Construction and installation activities in the first and second diversion tunnels of this facility completed fully and its third tunnel, which was planned to be constructed during the potential water-abundant season to ensure the facility’s safety as recommended by the World Bank experts, was constructed according to the schedule. The activities in diversion and auxiliary tunnels are also expanded to ensure the launch of other units of the hydropower plant and it is my firm belief that we will commission the plant’s second unit in 2019 as it is scheduled. Let me note that the today event is only the beginning of our efforts and we still need substantive amount of time and activities to accomplish our objectives fully. Given our experience and outcomes we achieved I can reassure you that we will complete the construction of the ‘Roghun’ HPP within the defined timeframe. The Government of Tajikistan has spent 24bn Tajik Somoni from the public budget since the beginning of construction activities in the facility. We spent 3.5bn Tajik Somoni from 2016 to present for the cofferdam construction alone. The noble people of Tajikistan remember very well that back on 5 January 2010 I encouraged them to contribute to construction of the ‘Roghun’ HPP – the source of light and heating for their households. I would like to take this joyful opportunity and offer my heartfelt gratitude to everyone, who got on board with my request and procured the power plant’s stocks and facilitated the construction activities in it. In this glorious day, I would like to extend my felicitation to all of the foreign companies, which make hard efforts in this crucial facility hand by hand with the Tajik builders, also to members of the Supervisory Board of ‘Roghun’ HPP Joint-Stock Company, and wish them further achievements and success in their endeavors. The strong will and desire of patriotic and dedicated children of our nation, which we feel in this field of hard work, hold us out a strong hope to prosperous future of our beloved Tajikistan. The time will come, when our children and we will proudly say that we constructed the ‘Roghun’ HPP – the grand light facility of our nation by our own labor, i.e. efforts of our glorious nation and in cooperation with the best adepts of this area from various countries of the world. After the ‘Roghun’ HPP starts operating in its full capacity, will turn into a grand facility of light and heat that will make the long-awaited desire of our civilization creature nation true, and all wishes and plans of the noble Tajik people will translate into reality. “Roghun” will be the pride of every citizen of our country now and in the future, it will be the source of patriotism and dedication, as well as warm feelings and honor of the Tajik nation! Our special gratitude and appreciation go to the builders of ‘Roghun’ HPP – heroes of creative and courageous labor! 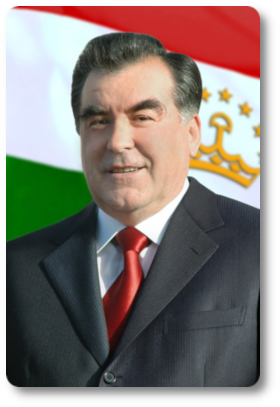 Our renown goes to patriotic, dedicated and decent people of Tajikistan! Long live the independence of the Tajik state! May the peace, political stability and the national unity long live in our beloved Motherland – Tajikistan! 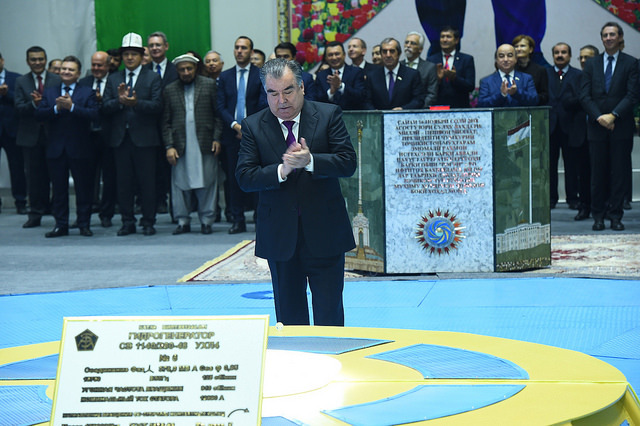 My sincere congratulations go to all of the honorable people of beloved and independent Tajikistan and you, distinguished participants on the launch of the first unit and initial power generated in this great facility of our nation, which reached every household in our country. May I wish you continued health, honor and happiness, dear compatriots!